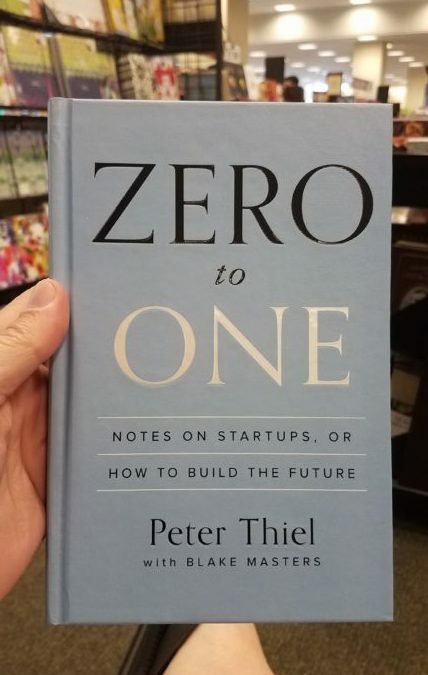 Zero to One is about how to build companies that create new things. It draws on everything I've learned directly as a co-founder of PayPal and Palantir and then an investor in hundreds of startups, including Facebook and SpaceX. But while I have noticed many patterns, and I relate them here, this book offers no formula for success. The paradox of teaching entrepreneurship is that such a formula necessarily cannot exist; because every innovation is new and unique, no authority can prescribe in concrete terms how to be innovative. Indeed, the single most powerful pattern I have noticed is that successful people find value in unexpected places, and they do this by thinking about business from first principles instead of formulas. Because globalization and technology are different modes of progress, it's possible to have both, either, or neither at the same time. If every one of India's hundreds of millions of households were to live the way Americans already do — using only today's tools — the result would be environmentally catastrophic. Spreading old ways to create wealth around the world will result in devastation, not riches. In a world of scarce resources, globalization without new technology is unsustainable. New technology tends to come from new ventures — startups. From the Founding Fathers in politics to the Royal Society in science to Fairchild Semiconductor's “traitorous eight” in business, small groups of people bound together by a sense of mission have changed the world for the better. The easiest explanation for this is negative: it's hard to develop new things in big organizations, and it's even harder to do it by yourself. Bureaucratic hierarchies move slowly, and entrenched interests shy away from risk. In the most dysfunctional organizations, signaling that work is being done becomes a better strategy for career advancement than actually doing the work (if this describes your company, you should quit now). At the other extreme, a lone genius might create a classic work of art or literature, but he could never create an entire industry. On our contrarian question — What important truth do very few people agree with you on? — is difficult to answer directly. It may be easier to start with a preliminary: what does everybody agree on? “Madness is rare in individuals — but in groups, parties, nations, and ages it is the rule,” Nietzche wrote (before he went mad). If you can identify a delusional popular belief, you can find what lies hidden behind it: the contrarian truth. Google is a good example of a company that went from 0 to 1: it hasn't competed in search since the early 2000s, when it definitively distanced itself from Microsoft and Yahoo! Americans mythologize competition and credit it with saving us from socialist bread lines. Actually, capitalism and competition are opposites. Capitalism is premised on the accumulation of capital, but under perfect competition all profits get competed away. The lesson for entrepreneurs is clear: if you want to create and capture lasting value, don't build an undifferentiated commodity business. A monopoly like Google is different. Since it doesn't have to worry about competing with anyone, it has wider latitude to care about its workers, its products, and its impact on the wider world. Google's motto — “Don't be evil” — is in part a branding ploy, but it's also characteristic of a kind of business that's successful enough to take ethics seriously without jeopardizing its own existence. In business, money is either an important thing or it is everything. Creative monopoly means new products that benefit everybody and sustainable profits for the creator. Competition means no profits for anybody, no meaningful differentiation, and a struggle for survival. So why do people believe that competition is healthy? The answer is that competition is not just an economic concept or a simple inconvenience that individuals and companies must deal with in the marketplace. More than anything else, competition is an ideology — the ideology — that pervades our society and distorts our thinking. We preach competition, internalize its necessity, and enact its commandments; and as a result, we trap ourselves within it — even though the more we compete, the less we gain. Professors downplay the cutthroat culture of academia, but managers never tire of comparing business to war. MBA students carry around copies of Clausewitz and Sun Tzu. War metaphors invade our everyday business language: we use headhunters to build up a sales force that will enable us to take a captive market and make a killing. But really it's competition, not business, that is like war: allegedly necessary, supposedly valiant, but ultimately destructive. Why do people compete with each other? Marx and Shakespeare provide two models for understanding almost every kind of conflict. According to Marx, people fight because they are different. The proletariat fights the bourgeoisie because they have completely different ideas and goals (generated, for Marx, by their very different material circumstances). The greater the difference, the greater the conflict. To Shakespeare, by contrast, all combatants look more or less alike. It's not at all clear why they should be fighting, since they have nothing to fight about. Consider the opening line from Romeo and Juliet: “Two households, both alike in dignity.” The two houses are alike, yet they hate each other. They grow even more similar as the feud escalates. Eventually, they lose sight of why they started fighting in the first place. Network effects can be powerful, but you'll never reap them unless your product is valuable to its very first users when the network is necessarily small. For example, in 1960 a quixotic company called Xanadu set out to build a two-way communication network between all computers — a sort of early, synchronous version of the World Wide Web. After more than three decades of futile effort, Xanadu folded just as the web was becoming commonplace. Their technology probably would have worked at scale, but it could have worked only at scale: it required every computer to join the network at the same time, and that was never going to happen. Every startup is small at the start. Every monopoly dominates a large share of its market. Therefore, every startup should start with a very small market. Always err on the side of starting too small. The reason is simple: it's easier to dominate a small market than a large one. If you think your initial market might be too big, it almost certainly is. You can also expect the future to be either better or worse than the present. Optimists welcome the future; pessimists fear it. Money makes money. “For whoever has will be given more, and they will have an abundance. Whoever does not have, even what they have will be taken from them” (Matthew 25:29). Albert Einstein made the same observation when he stated that compound interest was “the eighth wonder of the world,” “the greatest mathematical discovery of all time,” or even “the most powerful force in the universe.” Whichever version you prefer, you can't miss his message: never underestimate exponential growth. 3. Goals that cannot be satisfied, no matter how much effort one makes. Along with the natural fact that physical frontiers have receded, four social trends have conspired to root out belief in secrets. First is incrementalism. From an early age, we are taught that the right way to do things is to proceed one very small step at a time, day by day, grade by grade. If you overachieve and end up learning something that's not on the test, you won't receive credit for it. But in exchange for doing exactly what's asked of you (and for doing it just a bit better than your peers), you'll get an A. Thish process extends all the way up through the tenure track, which is why academics usually chase large numbers of trivial publications instead of new frontiers. Second is risk aversion. People are scared of secrets because they are scared of being wrong. By definition, a secret hasn't been vetted by the mainstream. If your goal is to never make a mistake in your life, you shouldn't look for secrets. The prospect of being lonely but right — dedicating your life to something that no one else believes in — is already hard. The prospect of being lonely and wrong can be unbearable. Third is complacency. Social elites have the most freedom and ability to explore new thinking, but they seem to believe in secrets the least. Why search for a new secret if you can comfortably collect rents on everything that has already been done? Every fall, the deans at top law schools and business schools welcome the incoming class with the same implicit message: “You got into this elite institution. Your worries are over. You're set for life.” But that's probably the kind of thing that's true only if you don't believe it. Fourth is “flatness.” As globalization advances, people perceive the world as one homogeneous, highly competitive marketplace: the world is “flat”. Given the assumption, anyone who might have had the ambition to look for a secret will first ask himself: if it were possible to discover something new, wouldn't someone from the faceless global talent pool of smarter and more creative people have found it already? This voice of doubt can dissuade people from even starting to look for secrets in a world that seems too big a place for any individual to contribute something unique. There's an optimistic way to describe the result of these trends: today, you can't start a cult. Forty years ago, people were more open to the idea that not all knowledge was widely known. From the Communist Party to the Hare Krishnas, large numbers of people thought they could join some enlightened vanguard that would show them the Way. Very few people take unorthodox ideas seriously today, and the mainstream sees that as a sign of progress. We can be glad that there are fewer crazy cults now, yet that gain has come at great cost: we have given up our sense of wonder at secrets left to be discovered. As a general rule, everyone you involve with your company should be involved full-time. Sometimes you'll have to break this rule; it usually makes sense to hire outside lawyers and accountants, for example. However, anyone who doesn't own stock options or draw a regular salary from your company is fundamentally misaligned. At the margin, they'll be biased to claim value in the near term, not help you create more in the future. That's why hiring consultants doesn't work. Part-time employees don't work. Even working remotely should be avoided, because misalignment can creep in whenever colleagues aren't together full-time, in the same place, every day. If you're deciding whether to bring someone on board, the decision is binary. Ken Kesey was right: you're either on the bus or off the bus. “Company culture” doesn't exist apart from the company itself: no company has a culture; every company is a culture. A startup is a team of people on a mission, and a good culture is just what that looks like on the inside. The first team that I built has become known in Silicon Valley as the “PayPal Mafia” because so many of my former colleagues have gone on to help each other start and invest in successful tech companies. We sold PayPal to eBay for $1.5 billion in 2002. Since then, Elon Musk has founded SpaceX and co-founded Tesla Motors; Reid Hoffman co-founded LinkedIn; Steve Chen, Chad Hurley, and Jawed Karim together founded YouTube; Jeremy Stoppelman and Russel Simmons founded Yelp; David Sacks co-founded Yammer; and I co-founded Palantir. Today all seven of those companies are worth more than $1 billion each. PayPal's office amenities never got much press, but the team has done extraordinarily well, both together and individually: the culture was strong enough to transcend the original company. In between personal sales (salespeople obviously required) and traditional advertising (no salespeople required) there is a dead zone. Suppose you create a software service that helps convenience store owners track their inventory and manage ordering. For a product priced around $1,000, there might be no good distribution channel to reach the small businesses that might buy it. Even if you have a clear value proposition, how do you get people to hear it? Advertising would either be too broad (there's no TV channel that only convenience store owners watch) or too inefficient (on its own, an ad in Convenience Store News probably won't convince any owner to part with $1,000 a year). That product needs a personal sales effort, but at that price point, you simply don't have the resources to send an actual person to talk to every prospective customer. This is why so many small and medium-sized businesses don't use tools that bigger firms take for granted. It's not that small business proprietors are unusually backward or that good tools don't exist: distribution is the hidden bottleneck. Fifteen years ago, American workers were worried about competition from cheaper Mexican substitutes. And that made sense, because humans really can substitute for each other. Today people think they can hear Ross Perot's “giant sucking sound” once more, but they trace it back to server farms somewhere in Texas instead of cut-rate factories in Tijuana. Americans fear technology in the near future because they see it as a replay of the globalization of the near past. But the situations are very different: people compete for jobs and for resources; computers compete for neither. The stark differences between man and machine mean that gains from working with computers are much higher than gains from trade and with other people. We don't trade with computers any more than we trade with livestock or lamps. And that's the point: computers are tools, not rivals. The differences are even deeper on the demand side. Unlike people in industrializing countries, computers don't yearn for more luxurious foods or beachfront villas in Cap Ferrat; all they require is a nominal amount of electricity, which they're not even smart enough to want. You can pick up a copy of this book here.